Millennials engage in media like no other generation. They are also ‘digital natives’, meaning that they grew up with a level of technological literacy much higher than their parents, and certainly their grandparents. As such, it may not surprise you that social media has become the very lifeblood of marketing to millennials – but that doesn’t mean that having a simple presence on the popular platforms will suffice. 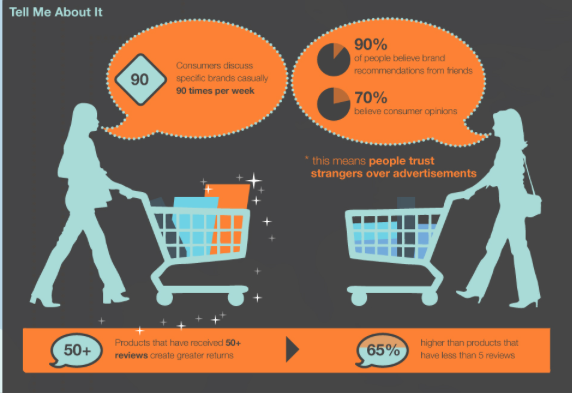 Indeed, one of the most important tasks for marketers is to create brand loyalty amongst consumers. However, with so many options in today’s world, and so many channels through which digitally-savvy millennials can access them, brand loyalty is much harder to achieve with this generation. Many of the traditional big brands that generation X and baby boomers quite simply adore don’t tend to resonate so well with the younger generation. Of course, millennials most certainly recognise the big brand names of their parents’ and grandparents’ worlds, but they just don’t hold them so dearly, nor put the same stock in their heritage. The challenge, then, is for brands – both incumbent and emerging – to make themselves relevant to the millennial generation. Let’s consider some millennial marketing strategies to keep this most important generation of consumers engaged. This is one of the biggest things to consider. In days gone by, loyalty meant that consumers would come back to the same brand for every purchase. People knew the brand they liked, and stuck to it. But this kind of loyalty doesn’t really exist amongst the millennial generation – so marketers have to think about loyalty in slightly different terms. Millennials don’t just return to the same brands time and time again by default – rather, they actively choose brands each time they make a purchase after careful examination of the previous experience. If the experience is rewarding each time, they will stick with the brand – but if any single experience doesn’t live up to expectations, you should expect millennials to be shopping around the next time. What’s more, as this cohort is smartphone-savvy, they have a whole host of product information, reviews and price comparison tools at their fingertips, meaning that millennials are able to turn to brands that can offer the best experiences and maximum convenience at the lowest possible cost. What this all boils down to is the need to make your brand the very best choice every single time by offering rich and rewarding experiences, great convenience, and the best prices and offers possible. We call them millennials, but ‘the social media generation’ would be an equally apt moniker. 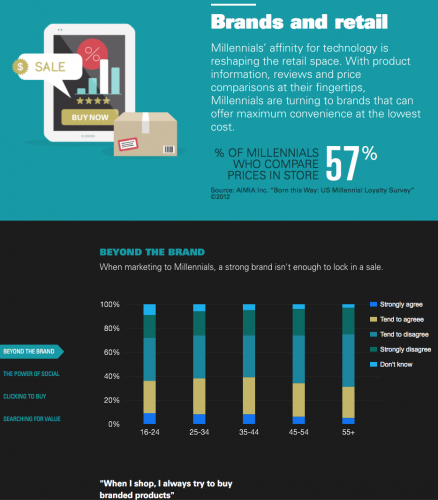 Social media is indeed a major influencer when it comes to the purchasing decisions of millennials. 72% of millennials have reported buying fashion or beauty products after seeing them on Instagram, according to research from Retail Dive, with the most-purchased categories being clothing, makeup, shoes and jewellery. But it’s not just brands promoting themselves on social media that holds influence. According to data from HubSpot, 90% of consumers are more likely to make an online purchase if the product or service is recommended by friends – and it is across social networks that many millennials make their opinions known about the brands they do business with. User-generated content (UGC) marketing has become one of the hottest millennial marketing strategies in recent times. And for good reason – it works. UGC marketing is the process of utilising content that regular web users (i.e. anyone who doesn’t work for the company the content promotes) have created for your company’s own marketing purposes. Something of a phenomenon of the modern internet, UGC marketing has risen in prominence largely in-line with the rise of social media – so it’s no wonder that it’s of particular interest to millennials. 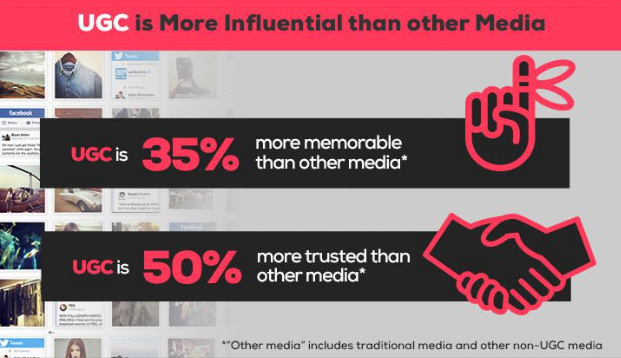 Indeed, according to research from Mashable, millennial consumers trust UGC materials 50% more than other types of media – including advertising – and find them 35% more memorable. Research from Gartner backs up these claims, reporting that 84% of millennials are likely to be influenced to make a purchase based upon UGC that is created by strangers. Brands can encourage their customers and social media followers to create UGC in a number of ways. The most famous example is perhaps Coca-Cola’s #ShareACoke campaign. This was when the soft drinks retailer started printing people’s names on the labels of Coke cans and bottles, and then encouraged consumers to share pictures of their personalised pop on social media. Other brands, such as National Geographic, have run competitions which encourage followers to create great content for sharing on platforms like Instagram – which is, of course, a firm favourite with millennials. 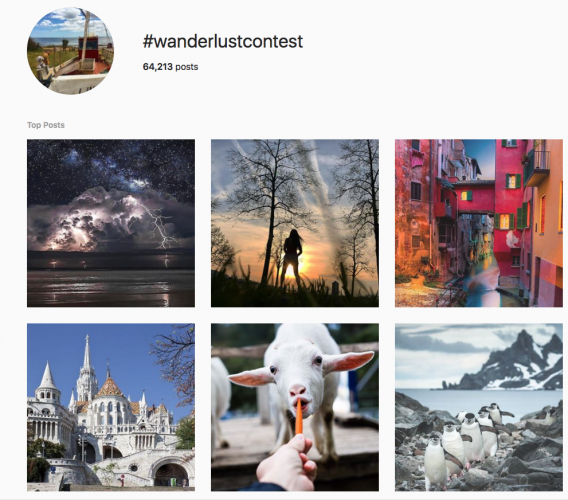 National Geographic’s “Wanderlust” contest involved asking followers to use the #wanderlustcontest hashtag when posting photos of the “unforgettable people, places and experiences that impacted their lives from their travels around the world.” Participants had the chance to win a National Geographic Photo Expedition to Yosemite National Park. But, more importantly, it was a great way for National Geographic to tap into a huge database of glorious travel photography – provided at zero cost by its community – and then use this content to promote the National Geographic brand. For a generation that doesn’t trust branded messages, they do most certainly trust the content that is shared by disinterested third parties. When it comes to millennial marketing, a good user-generated content campaign is almost certainly going to be a winner. UGC creates trust in your brand – if a consumer is so excited about a company that they are creating their own content to promote it, then that is a vote of confidence in no uncertain terms. Millennials want to know that the brands they do business with are driven by more than just profit. They want to see that the brand is using its position to support the planet, change lives, or give something back to communities. In the past, it was almost unheard of for a brand to take a stand on social, political or economic issues for fear of alienating significant portions of their customers. But gone are the days of neutrality in marketing – at least when it comes to millennials. This generation wants to know exactly what brands stand for, and if you can communicate this effectively, they’ll stand by you. 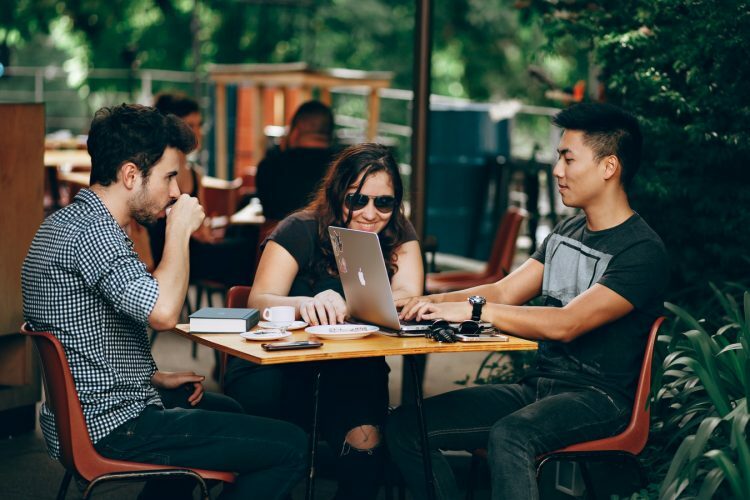 If your brand has a purpose, you will make an emotional connection with millennials, and that will go a long way towards earning that elusive loyalty from this cohort. To give you a couple of examples. 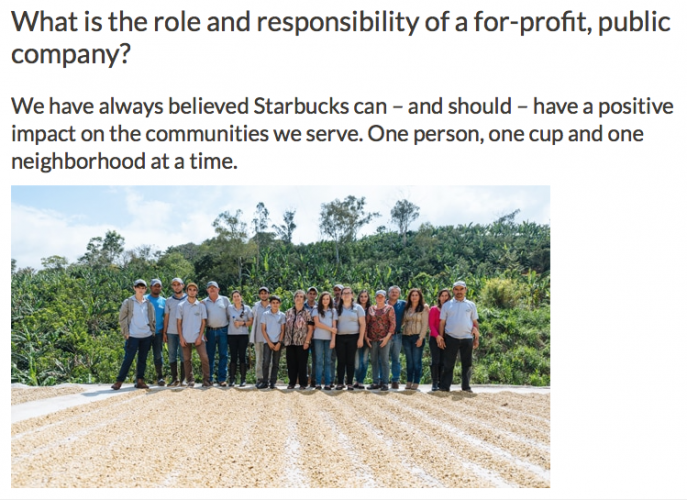 The Starbucks corporate responsibility initiative shows commitment to fighting hunger, supporting communities and helping the environment. It aims to source products ethically and sustainably, create opportunities through education, training and employment, and be a leader in green retail – and it pushes this message through its millennial marketing campaigns. 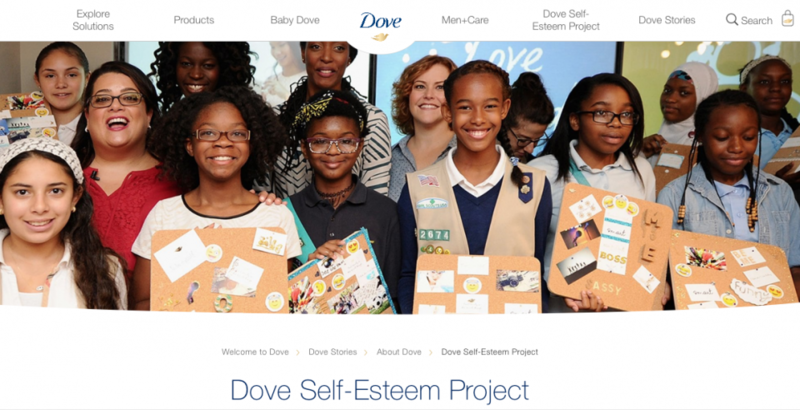 Elsewhere, personal care brand Dove has recognised that low self-esteem is a huge problem for many girls and women, and so has create the ‘Dove Self-Esteem Project’ to “help the next generation of women realise their full potential” and “enjoy a positive relationship with the way they look”. Together with leading psychology, health, and body-image experts, Dove has created a programme of world-class resources designed to develop and increase body confidence and self-esteem in young people. These are brands with real purpose – and exactly the sort of thing that appeals to millennials. Millennials are disrupting marketing. Long gone are the days when a brand could rely on newspaper advertisements, billboards, and TV commercials to promote themselves. Millennials are suspicious of these messages, and instead want brands that they can engage with and trust. Concentrate on creating great experiences and realise that loyalty no longer comes cheap and easy. Reach millennials where they are on social media, and utilise the power of user-generated content marketing to win their trust. Finally, have purpose and take a stand, as this will elicit emotional connections, and separate your brand from all the others that millennials are constantly evaluating and comparing you against. If you need help developing and executing a millennial marketing strategy, get in touch with us here at Cope Sales & Marketing – www.cope-salesandmarketing.com. We’d love to hear from you, and will be very happy to chat through your requirements.